There's nothing quirky about chess. Some get a thrill out of playing it while others are bored out of their minds. Regardless of if you are a chess player or not, though, this is somewhat interesting. The classic game of chess with the same set of rules as always, has been revamped and tweaked into a rather quirky style. Now still, the rules are the same, but the game play has been altered somewhat. It's for three people now! Check it out. The site gives some great detailed overlays of exactly where the pieces can move. 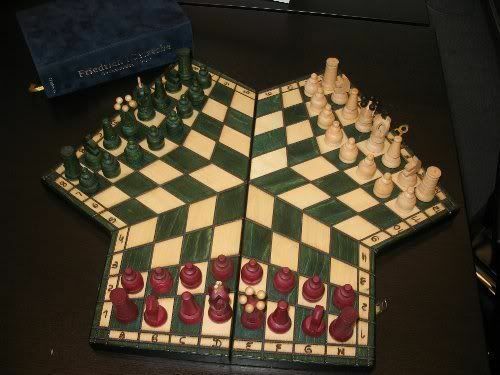 Of course, it really is the same rules and same moves, but it can look tricky because of the board split, so this just simplifies it back down to your normal game.